Offering a gorgeous antique New England Hepplewhite drop-leaf farmhouse table with wood peg joinery. Circa 1800-1820. 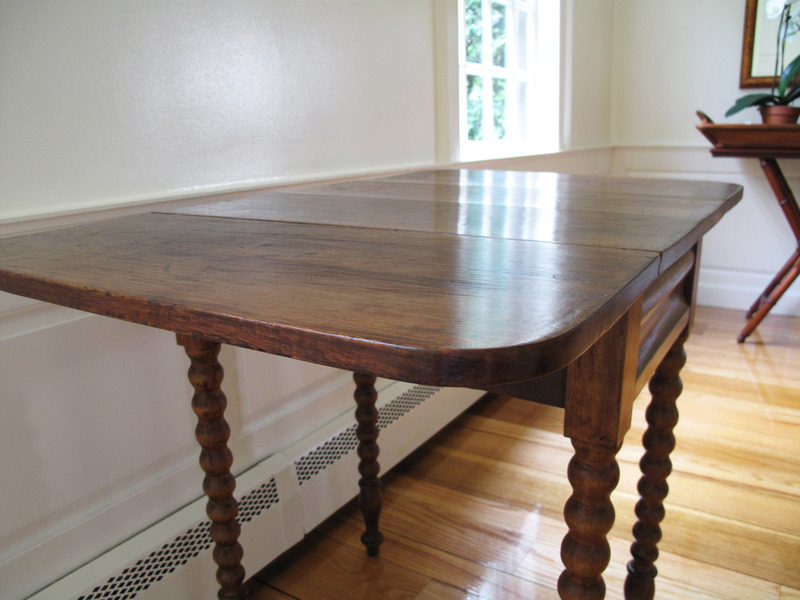 The farmhouse table originated from the Deerfield area or surrounding valley in Western Massachusetts. It’s very solidly made, with nice period handcrafted details in the construction. The Hepplewhite farmhouse table is made of pine. Both leaves are held by a pivoted cutout on two sides, so one leaf can be dropped and one left up. Four adults can be seated at this table and it’s exceptionally sturdy for everyday use, given its age. 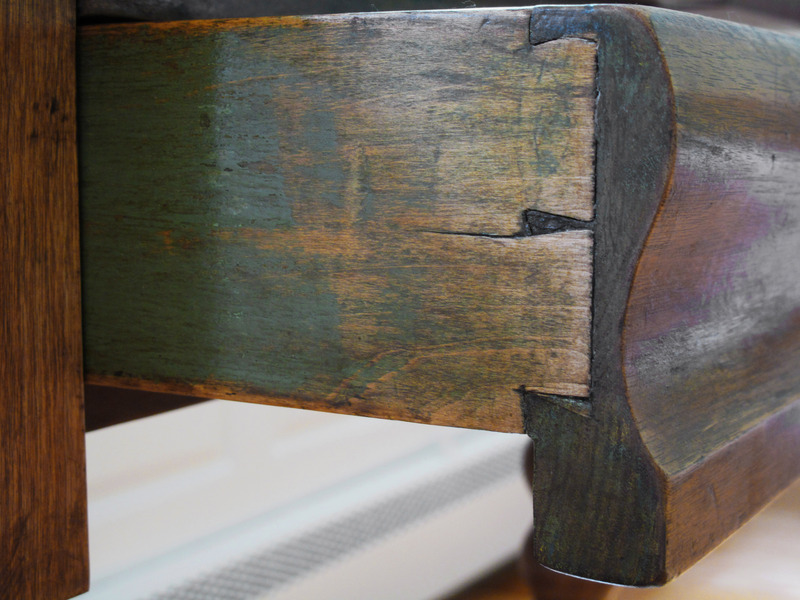 The history is present in a wonderful worn patina to the surfaces and joinery. There are plenty of scratches and a very old dark spot left behind from a candle holder. It has a lovely simple rustic feel. The simplicity of an antique country Hepplewhite table lends itself well to both traditional settings and more contemporary spaces alike. Perfect for a period home, or modern city loft with limited dining space. The drop leaf compact style makes it perfect for a sideboard table too. Click here for more details. Offering a stunning antique maple and cast iron drafting table made by Hamilton Manufacturing Co. The cast iron knobs, legs and hardware are fantastic. The base is made of black painted maple and the extra large table surface is made of pine with oak trim on both ends. 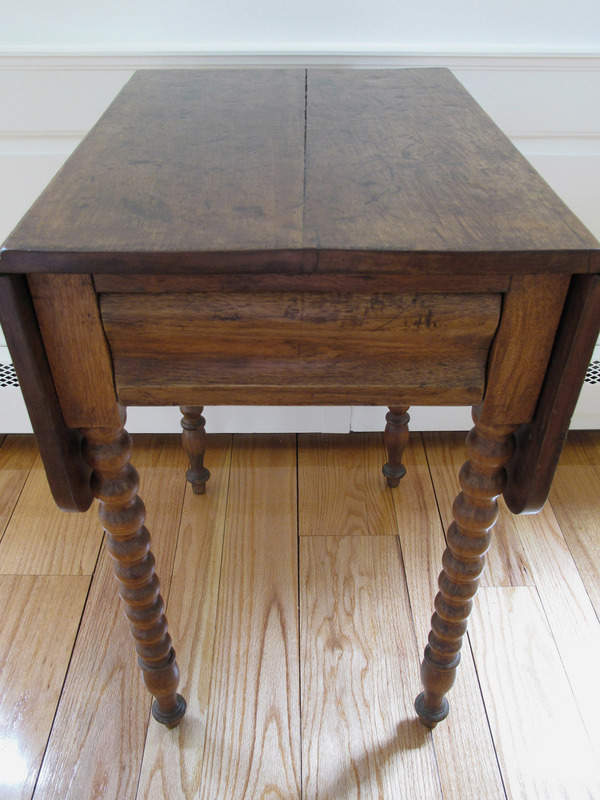 There’s a scarce maple foot rest attached to the cast iron legs, which is removable. 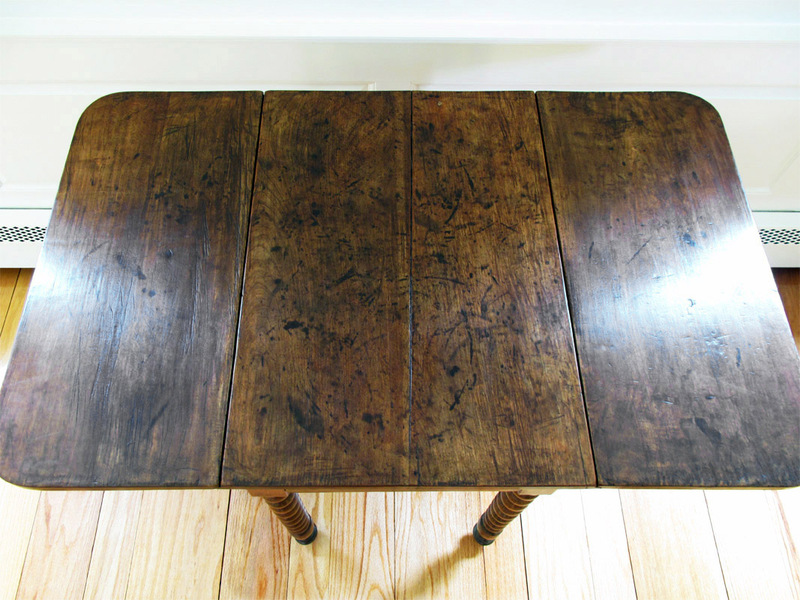 Excellent patina and desirable wear to the wood surfaces, which show its age and character. Everything is completely functional and very sturdy. The drafting table has a tilt function, and is also height adjustable. It has been carefully cleaned and waxed, while leaving all its original character and wear. The table surface has wear at four corners of the surface due to years of drafting with a compass point, which has left shallow pin point indentations, but a glass can easily rest on the concentrated spots. For drafting use, it would be best to use a drafting mat on the drawing surface, and its about one of the largest dimensions you can find for a drafting table. The piece is perfectly suited as a desk, dining table, kitchen island/table, or a cocktail table in a commercial setting. Excellent versatility. The ability to adjust the height makes the table perfect for use with chairs or stools. The industrial design lends itself well to plenty of uses in various decor environments. Whether it be a compact NYC loft or a home office, this table will provide limitless options, as a show piece in whichever room you choose. Click here for more photos and details. This one has sold. We have another nearly identical one recently listed for sale. The same cast iron legs, and table surface dimensions. It’s a stunning vintage drafting table. Click here for the latest posted drafting table. Offering a handsome cast iron and wood drafting table. Circa 1910s-1920s. 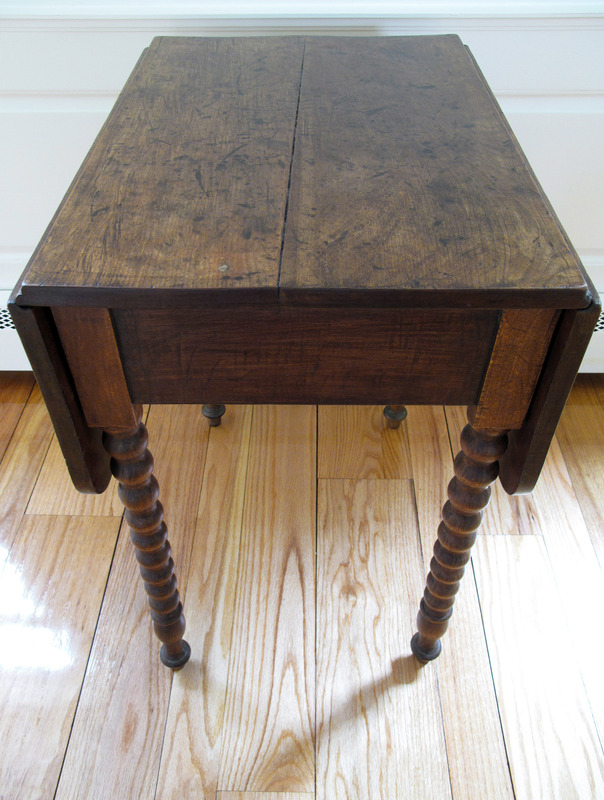 I’ve sold a lot of antique/vintage drafting tables, but this is a very unique one with solid cast iron legs. It’s also rather large with the table top measuring 60 inches wide. The drafting table is in remarkable condition, and everything works perfectly as intended. There’s a lot of versatility with these old industrial furniture pieces. I’ve sold vintage drafting tables to buyers intent on using them for various purposes. Frequently they get repurposed as kitchen islands, dining tables and desks. For more information on this drafting table, please visit Hartong International on Chairish. In February, we will begin listing many of our latest acquisitions. There will be several antique tables, Barn-wood tables, French hand-carved chairs, an 18th century English sofa, oil paintings, a lovely Victrola and much more. Check back often, as items will be added over a period of weeks. Meanwhile, many antique and vintage items are available on Etsy. A fantastic example of country American Empire. 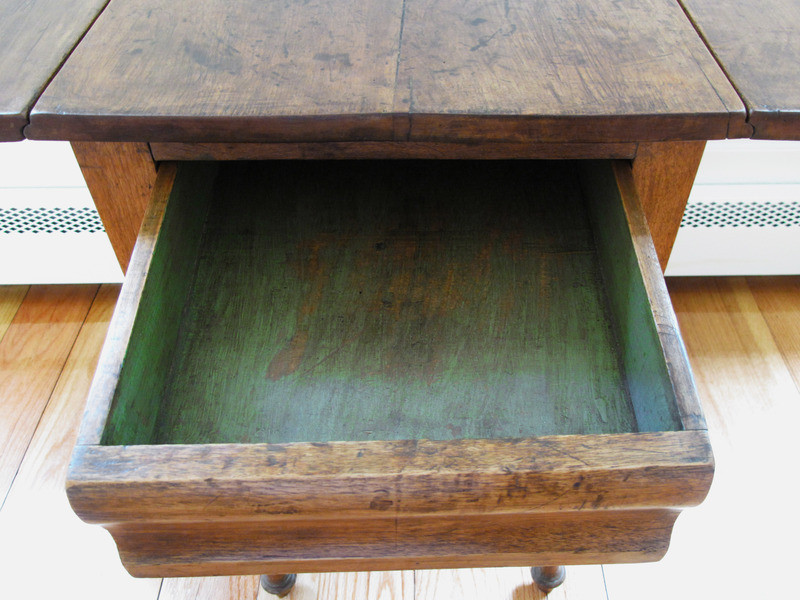 It’s all original, with some of the green paint still visible, especially around the drawer. 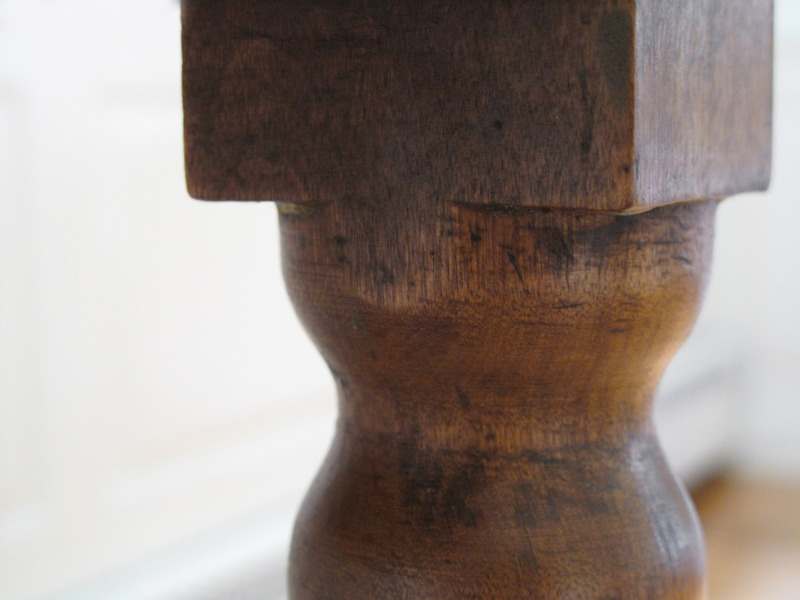 The entire piece has received a coat of wax to bring out the depth of the original finish. The base and legs appear to have once been painted in a period green, which must have been semi-removed long ago. It was an estate find from a farmhouse, with many items having been untouched for a very longtime. The wear and patina are so attractive and give testament to the age of this piece. In very solid condition, with nicely working hinges and smooth gliding runners. 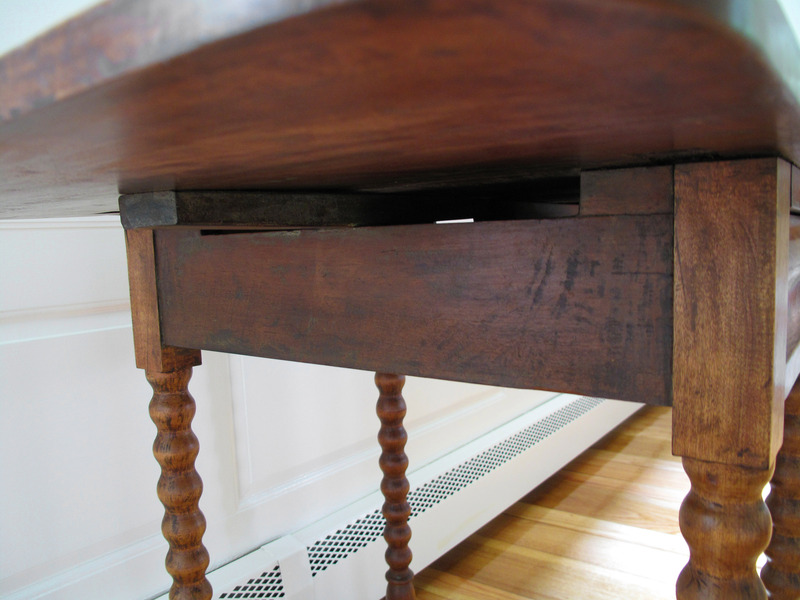 The table is mainly made of mahogany, with drawer bottom, back and sides of pine. All dovetails are strong, within the drawer. Local pickup would be desired. Delivery can be arranged throughout New England, Boston and New York City.